On a scale of 1 to 10, how would you rate your knowledge of wine? How much would you typically spend on a bottle of wine in a store? How many different types of wine (merlot, riesling, cabernet, etc.) would you buy regularly (not as gifts)? Out of the following 8 wines, which do you think you could correctly identify by taste? Today, we'd like to take a look at the results of the survey to answer some questions about our participants. 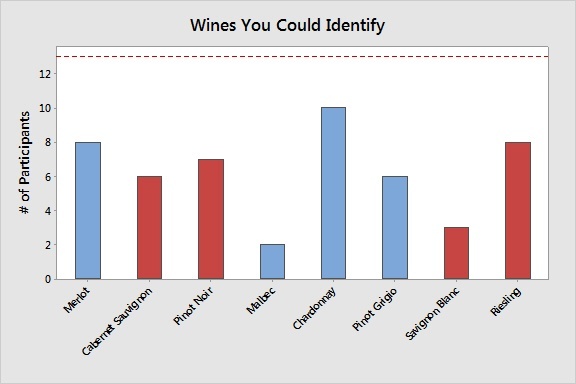 * The default color in Minitab for the second group on any graph with attributes being controlled by groups is not actually called "red" but rather "wine," a clear indication this experiment was meant to be. Next we wanted to see if there were any relationships between responses to different questions. 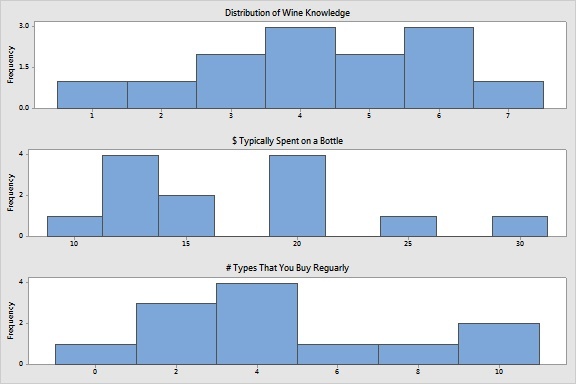 For example, do participants with greater self-identified wine knowledge spend more on wine, or buy more types of wine? 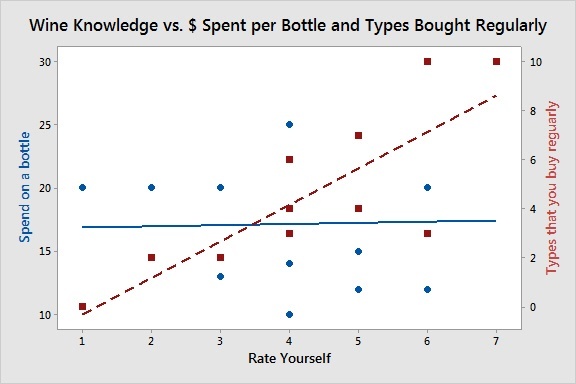 While there was no evidence that claiming more knowledge is related to how much participants spent per bottle, there was a significant relationship with how many different types they bought regularly (p = 0.001, R-Sq = 66.2%). Perhaps those less knowledgeable stick to a few known types and spend more to make up for a lack of knowledge? And could it be that those with more knowledge buy a large variety, but know how to select without spending too much? We can't say definitively, but the results give some possibilities to consider. 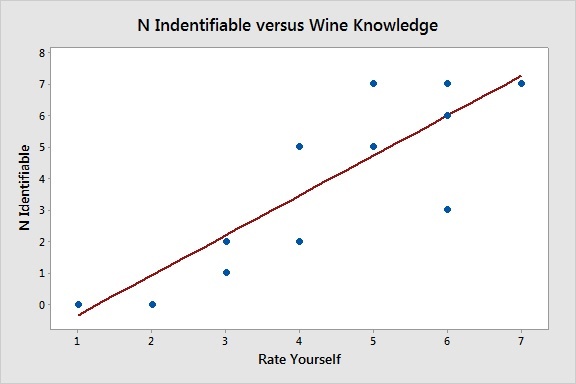 Again we see a significant relationship (p = 0.000, R-Sq = 70.6%), indicating that familiarity with many types of wine is closely linked with self-identified wine knowledge. How well do you think the survey results will align with the experimental results?